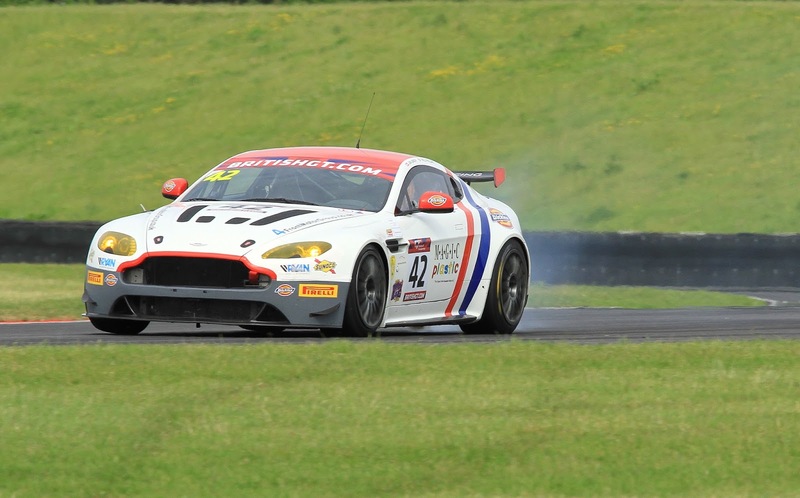 During the interval between races yesterday, work and adjustments carried on apace on both of the TF Sport GT3's and the MacMillan GT4 that sustained frontal damage in a racing incident earlier. 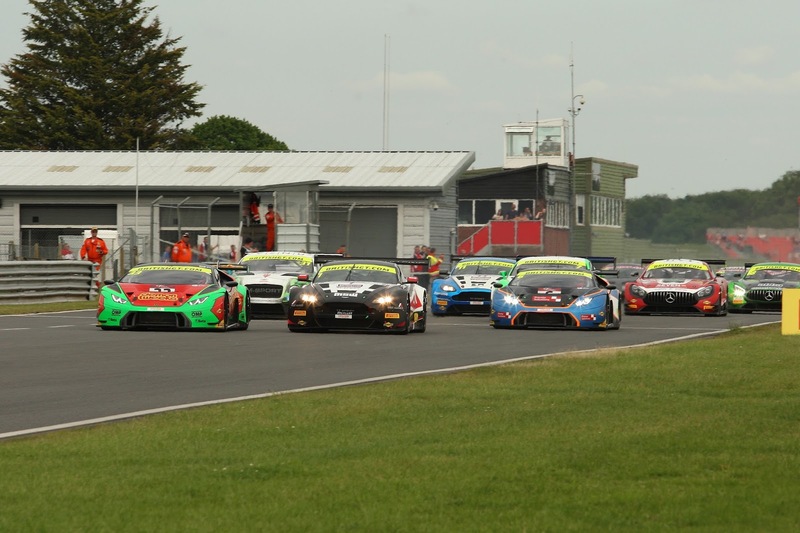 From Saturday's Pro Qualifying sessions Race 2 starting grid would see Jonny Adam start from behind both of the Lamborghini's in P3, Jon Barnes in the #11 car in P7 and James Littlejohn in the #24 from P9. Then in the GT4 field Matt Nichol-Jones would start his car from tenth with Jan Jonck starting the #42 from the back again. At the green flag , a great 'ballsy' start from Adam would see his car move up and hold second place, splitting the Lambo's, as the front of the pack went around Riches for the first time with cars going into the tight right hander three or four wide. Misfortune was soon to strike at Littlejohn however as he would spin out at Brundle before rejoining the pack plum last. 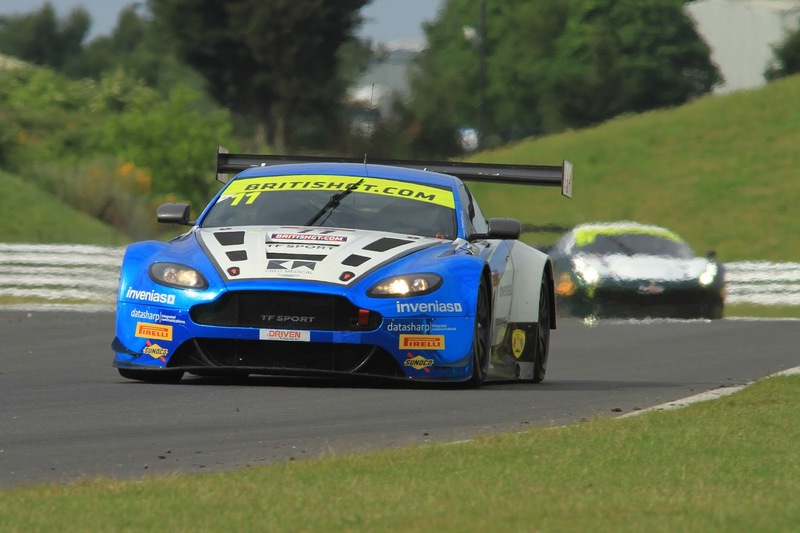 It would also be a fraught race for the GT4 AMR runners with the #62 never being able to progress past the much more nimble Ginetta's and Mclarens and for his stint, everything would go somewhat unrewarded. Jonck would also have a difficult opening stint, presumably hampered from the effects from Race 1's frontal damage before blue smoke could be seen exiting the vehicle as they approached the halfway mark - the car would not make its way back out of the pits. 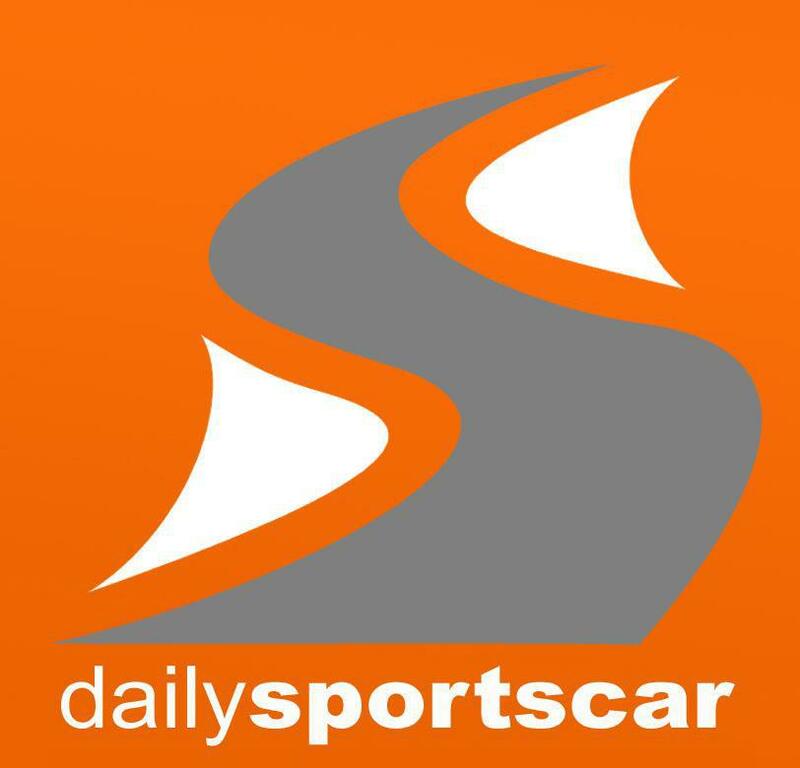 To quote TF Sport Team Manager after the race - the TF cars didn't have the pace to keep up with the Lambo's, they just had the ability to make themselves very wide and in effect hold everyone else up!! 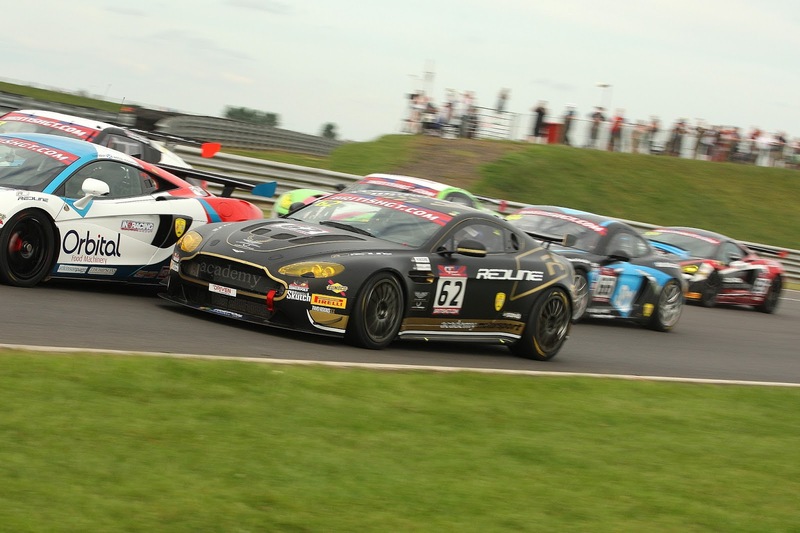 That was certainly the case as the leading #33 Barwell car had already made its exit was way up the track from the following pack and it looked like it would simply be a battle for the remaining steps of the podium. In true British GT style however, a late call for a Safety Call to recover a stranded Bentley on the back straight would at least bunch everyone back together just after many of them had just made their driver changes. Very soon after that race officials made a race changing decision by penalising the #33 car for too shorter pit stop!! 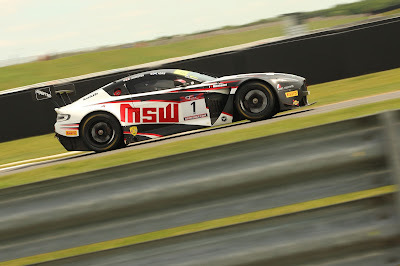 Whilst it was game over for them, that decision left the #1 car out in front with the #11 car in third and the #24 MacMillan flying around the track trying to get on the back of the podium positioned cars as they looked for more silverware with little over ten minutes remaining. You could kind of sense Johnston willing his car around the corners and without exceeding track limits as had been the result of the cars problem before as he gradually started to eek out a small lead over the rest of the chasing field. 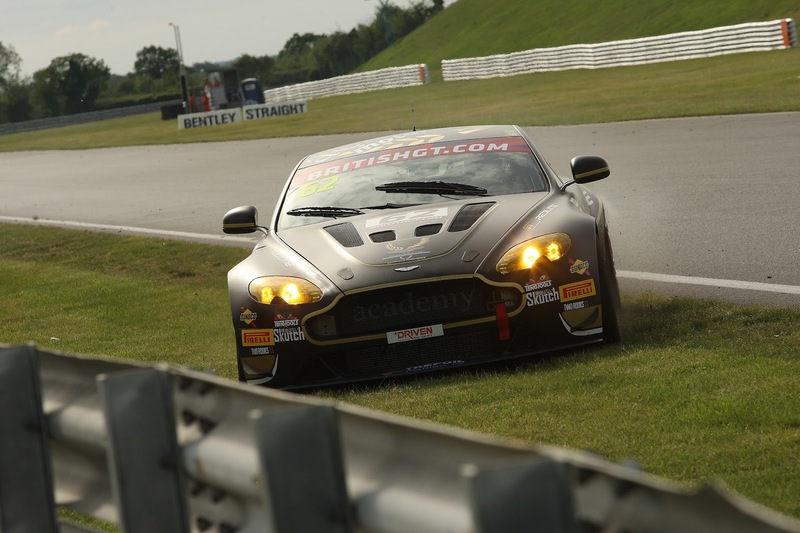 The drama wasn't over though as the #62 Academy car with Will Moore at the wheel came to a grinding/smoking halt at the same place as the now recovered Bentley had on the back straight due to wheel/suspension damage taken from an absent minded Ginetta driver at Murrays the lap before. We can tell you that Moore was non too impressed with that outcome!! 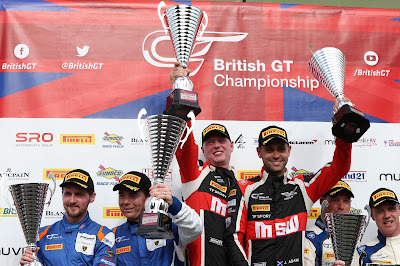 Finally the chequered flag was dropped and the #1 car had won what was an eventful yet totally enjoyable race with the long faces of earlier having quickly disappeared in the sprays of champagne. For TF Sport it was double success as Farmer brought home his #11 in P3 after having raised his hand to making the mistakes in race 1 that put the car out of contention then. The team say that they have not fully cured the cars handling issues with these podium finishes but they have certainly taken large steps in the right direction. They now head to Silverstone on Tuesday for more testing before that round of the series in two weeks time. In between that and now, the team have the small issue with a date at Le Mans! !